Minnesota State Fair: An Illustrated History, by Kathryn Strand Koutsky and Linda Koutsky in collaboration with Minnesota State Fair. Minneapolis, MN: Coffee House Press, 2007. Blue Ribbon: A Social and Pictorial History of the Minnesota State Fair, by Karal Marling. Saint Paul, MN: Minnesota Historical Society Press, 1990. MNHS call number: FOLIO S555. M6662 S76 1990, also available for purchase. State Fair: The Great Minnesota Get-Together Photographs, by Susan Miller; foreword by Lorna Landvik. Saint Paul, MN: Minnesota Historical Society Press, 2008. MNHS call number: S555.M666 M55 2008, also available for purchase. Minnesota State Fair Annual Program Collection, 1947-1984. Programs giving a comprehensive overview of the fair, including lists of daily events, Grandstand performances, and new items at the fair that year. 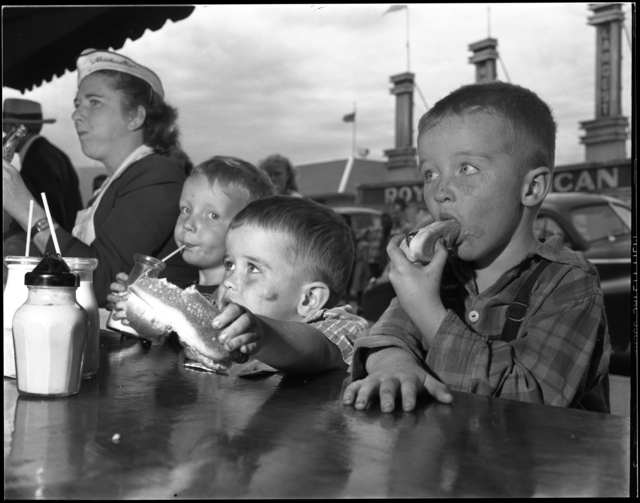 The first official State Fair was held in 1859 in Minneapolis by what is now Fifth Street and Marquette Avenue. It was by no means a great success, with bad weather and a small number of displays causing low attendance. The second Fair, held in 1860 at Fort Snelling, was much more successful. In 1885, after a long struggle between the cities of Minneapolis and Saint Paul, the final location of the Fair in what is now Falcon Heights was decided upon. Early Fairs were focused on agriculture, with the big draws coming from displays of new farm technology and prize-winning animals. As the State Fair has evolved the main focus has remained on agriculture and industry, but has also grown to encompass the fields of education, art, entertainment, technology, politics, and more. Today the Minnesota State Fair can be seen as representative of life in Minnesota, with the goal of showcasing the best of the best Minnesota has to offer.